Winter is the season that really tests your heating system. Maintaining your hot water heater and boiler or furnace is a crucial step to keep things working smoothly. What is Furnace Puff Back? A puff back is the explosion of accumulated oil in the combustion chamber of your boiler or furnace that can happen when the furnace isn’t igniting properly. If you have to hit the reset button on your heating equipment more than once to get it started, there’s a problem that needs to be looked at. While the furnace runs, leaky pipes that make ignition difficult can cause oil to build up. That oil can ignite at the start of the next burning cycle. This can cause an explosion that sends soot through the exhaust system, in to your heating system, and all over your house. If you have a forced hot air system, the soot will potentially come out of every open vent. Have your system serviced annually. Your technician should check for leaks in the oil system, bubbles in the oil line, a clog in the nozzle, and proper function of the shutdown valve on the nozzle. Units should be opened and thoroughly inspected. Also make sure any new chimney or heating system installation was done correctly. You can also do monthly preventative checks yourself. Look for leaks, check for smells, or signs of soot or dirt around pipe fittings, and on the furnace or boiler, the walls and the ceiling. Check the fuel vent connector for any debris. Pay attention to any unusual noises or rumbling such as big puffs at the beginning of the burn cycle and noises even after the furnace has stopped. Furnace puff back from an oil heating system is dangerous and dirty business that can make a mess of your house and damage your furnace. The clean up and necessary repair or replacement of equipment can be quite costly. If it happens, the best thing you can do is act quickly. 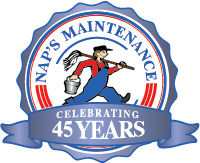 Here at Nap’s Maintenance we are experienced with taking care of damage from fire and soot. Call us today for a quote. Keep the temperature at 120 degrees to avoid scalding, keep the unit from burning out, and to save on energy costs. Keep a 2 foot open clearance around the tank. Check the pressure relief valve by lifting it up half way and releasing. It should snap back in to place, and you should hear the gurgle of water going back down the drain tube. Inspect your sacrificial anode rod about every 3 years. If the rod is: less than 1/2 inch thick, is covered with calcium deposits, or more than 6 inches of the core wire is showing, you’ll need to replace this piece. Look at the fan attached to your condensing unit regularly to make sure it’s in good condition. The older the model, the more frequently it will need to be oiled. If the fan blades are chipped or cracked, replace the fan immediately. Watch for signs of overheating, and burned or melted insulation and wires. Flush out the tank every three months or so to remove any corrosion causing debris that has built up in the bottom of the water heater. You’ll want to flush it out by draining about 25% of the tank to remove any unwanted sediment. Insulate older units with an insulated jacket, and insulate your cold and hot water pipes. If you have a gas heater, adjust the thermostat to “vacation” mode when you’re away. This maintains the pilot light without heating the water. Make sure your maintenance dates are clearly marked on the water heater so you know when to have it done again. These are the best things you can do to help your hot water heater to reach its 15 year life expectancy. But if your tank should fail unexpectedly before then, leaving you with a flood in your basement, Nap’s Maintenance can help. We are experts at taking care of water damage, so call us for advice.